I like to call them the A-Team because, well, they are a bunch of Amazing Aces (so...AA-team?..huh...). The team is comprised of The Baus Grasshopper (also known as Yooruce Willis, Yoomes Bond or Yoohyuk), The Commander Sparta Coach Kookie, Sudden Commander Kang GaeRi and the rose among the thorns, the Fearless Ace MongJi. They do not exactly move in a team, the way the Betrayers' Club do. They are more like elite aces who like to battle each other out to see who will emerge Champion among the champions. Each has his or her own strengths and has no problem attaining solo wins. Needless to say, they are very wary of the Betrayers' Club and will find ways to eliminate the three traitors first before advancing on each other. A well-loved Nation MC who has evolved into a water gun-totting, ruthless (but still ever so chatty) spy. 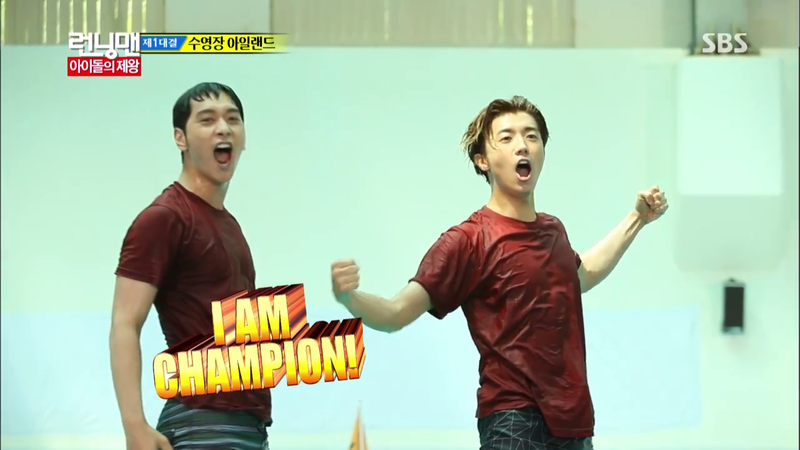 I'm too lazy to do research or go through my Running Man video collection (downloaded from here and here), so I won't mention on which episode did we first see this side of the humble MC emerge. Specialties: Water gun. Ttakji (challenged only by the ever-capable Coach Kook). Runs like the wind. Talking and talking and talking. Weaknesses: Height. Anything scary, really (true scaredy cat). Singer turned variety champ who never fails to amaze the audience with his one-man strength. This is apparent since the first episode of Running Man. Oh, of course he still sings. Sparta Kook dragging 4 people hanging onto his back. Specialties: Ability to act cute despite all those muscles. Smart (Sukjin tells him to go work for the government, solving their country's crime cases). Ability to jellify people's knees or induce minor heart attacks in people who unexpectedly bump into him. Weaknesses: Pretty girls, especially Yoon Eunhye. Strong instinct to coach. Specialties: Peaceful. Acts so chill that opponents undermine his capabilities. Surprising ability to win big prizes (like the Europe trip). Has found himself a good Monday woman. Weaknesses: Unfortunate mug? Also, the last to comprehend anything ㅋㅋㅋ. A talented actress who gives zero fucks about her starlet image. I love a lady who can confidently face conquer the world without a trace of make-up on. Hey, U-go-girl! (<--sung by another beauty who has zero image maintenance on variety showsXD). Often easily defeats her opponents without really breaking a sweat. She's not called Ace for nothing. Specialties: Very good in acting - her usual aloofness add to that capability (her acting in Episode 140 is by far my favorite). Has Kang Gary in her hands. Has a sharp mind, albeit that (misleadingly) blank look. Fearless. Weaknesses: Blank. (a weakness that is a weapon at the same time - see above). So these are the RM aces. I love both Betrayers' Club and the A-Team because the way I see it, Running Man won't be complete without one or the other. It's the chemistry among all seven members that make this show work so well. Whenever there are guests, I root for any one of the A-Team to bring them down. When it's just the seven of them going against each other, I find myself rooting for the underdogs to (miraculously) beat the A-Team. See kids, miracles do happen. But in the end, it doesn't matter who wins (dem gold tho), I still love them all *showers of hearteu*.